•Morning Arrival - 8:45 a.m.
•Students are tardy after 9:00 a.m. Parents must sign their children in if they arrive after 9:00 a.m. Parents must inform the school of reason for tardiness. •Crosswind students are to arrive on campus no earlier than 8:45 a.m., unless they are participants in the YMCA Before School Care or the Before School Tutoring Program. •No Parking or departures will be allowed in the Visitors parking area in the circular drive between 8:00 a.m. and 9:00 a.m.
•No Parking on Shelton Rd. from circular drive entrance point to circular drive exit point. 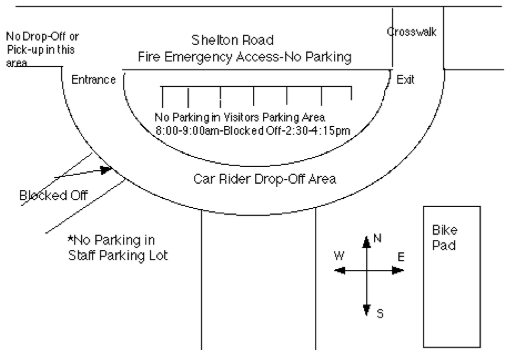 Area designated by Collierville Police Department as our school's "FIRE AND EMERGENCY ACCESS". •Proceed to the end of the painted lines of the circular drive. Park cars in single file nearest the curb. Place auto transmission in "PARK" when traffic flow stops for student exiting. •Drivers should pull up directly behind the car in front of them to maximize the use of available space. •Attendants will direct students to depart on the curb side of the circular drive. Attendants are present to assist with safety. •Cars must stay in line, parallel to the curb. No vehicle should pull around or pass another vehicle in this line. •Please adhere to a five mile per hour speed limit while driving on the school grounds. •A note is required for early dismissal. Phone requests for early dismissal are discouraged. •Children must be picked up in the office and signed out of school by the parent, guardian or others designated on the registration form. •Photo identification is required of all persons signing a student out of school. •The safety of our students is a number one priority. ◦Bus/Daycare Riders- All buses are called at one time. ◦Bikers - Called by grade levels. Dismissed at time of buses. •No Parking or departures will be allowed in the Visitors parking area in the circular drive between 2:30 p.m. to 4:15 p.m.
•Proceed to the end of the painted lines of the circular drive. Park cars in the single file nearest the curb. Place auto transmission in "PARK" when traffic flow stops for student exiting. •Child's name must be visible in car front window to attendants. •Attendants will direct students to enter designated cars on the curb side of the circular drive. Attendants are present to assist to with safety. •When all cars are filled an attendant will direct the cars to leave the loading zone. Attendants will direct cars to depart when deemed safe. •When the lane of cars has cleared the loading zone, attendants will direct additional cars to enter the drive and repeat the above procedures until all students have been picked up. •PLEASE DO NOT WALK STUDENTS BETWEEN CARS TO ENTER OR EXIT THE SCHOOL. Use the circular sidewalk. •Bus riders will be dismissed from classrooms. •Parents are responsible for the supervision of students until such time as the child boards the bus in the morning and after the child leaves the bus at the end of the school day. •Bus route assignments are based on the students' legal residence. •A bus is an extension of the classroom, and students must conduct themselves on the bus in a manner consistent with established standards for classroom behavior. •Bike riders/Scooters/Skateboards/Skates -will be dismissed by grade levels to the crosswalk area nearest the bus loop and back of school - nearest the gym. •Bikes/Scooters/Skateboards/Skates will not be taken to the classrooms. •Bikes/Scooters/Skateboards/Skates must be walked when on school property or when traveling the crosswalk. •Walkers living in the Crosswinds, Wellington Farms, and Wellington Ridge Subdivisions will not receive bus transportation and are to use the designated walking pattern. •Crosswinds I, II, and III - Students will exit the rear door of the school nearest the cafeteria and proceed to cross the bridge or use the pathway toward Crosswinds III. •Wellington Farms and Wellington Ridge - Students will cross at the CROSSWALK on West Shelton Rd. nearest the exit drive when directed by the crossing guard. •PLEASE DO NOT WALK STUDENTS BETWEEN CARS TO ENTER OR EXIT THE SCHOOL. ◦When parents walk their children through the cars to a point where they are parked, a dangerous situation is created. •Attendants wear orange safety vests to improve their visibility and identity as school staff. •Do not enter or exit by way of the flag pole walkway. ◦8:00 a.m. to 9:00 a.m. and 2:30 p.m. to 4:15 p.m.
•Please obey the "Five Mile Per Hour Speed Limit" when driving on school grounds. •When entering the circular drive, all cars must be placed in park. •Stormy weather-consisting of heavy rains, lightning, thunder and icy weather. •Students will not be dismissed as normal until the weather has cleared. •If you wish to check your child out in these conditions, students will be released from their classroom to their parents or authorized individuals. •Only authorized individuals are permitted to check out a child other than their own. •Parents or Authorized Individuals must show a Picture I.D. to the teacher and sign the check-out form in the classroom. •Crosswind has an emergency management plan in place to include fire, tornado, earthquake, and crisis procedures. Emergency procedures are practiced on a regular basis. In the event of locally severe weather or crisis, the school is notified by means of our weather and emergency radios. ◦Encourage students to adhere to all directions given by staff and respond quickly in an orderly manner. ◦Keep the students' personal data form in the office up to date. ◦In the event of an emergency, do not park on the school grounds. Please park on the roadway. (Driveways must be kept open for buses and emergency vehicles). ◦Please do not attempt to call the school. Telephone lines must be used for emergency communication. Listen to your radio for the school dismissal plan. We encourage your family to practice emergency procedures at home to emphasize the importance of safety at home and school. The safety of our children is a number one PRIORITY. WE MUST LOOK OUT FOR THE CHILDREN!! !